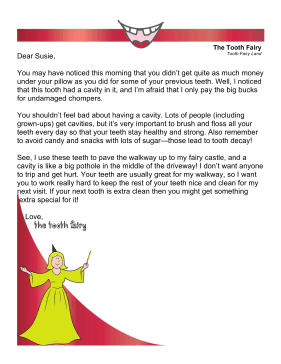 To use when children are falling behind on dental hygiene, this free, printable tooth fairy letter scolds the child for getting a cavity and docks their reward. You may have noticed this morning that you didn't get quite as much money under your pillow as you did for some of your previous teeth. Well, I noticed that this tooth had a cavity in it, and I'm afraid that I only pay the big bucks for undamaged chompers. You shouldn't feel bad about having a cavity. Lots of people (including grown-ups) get cavities, but it's very important to brush and floss all your teeth every day so that your teeth stay healthy and strong. Also remember to avoid candy and snacks with lots of sugar�those lead to tooth decay! See, I use these teeth to pave the walkway up to my fairy castle, and a cavity is like a big pothole in the middle of the driveway! I don't want anyone to trip and get hurt. Your teeth are usually great for my walkway, so I want you to work really hard to keep the rest of your teeth nice and clean for my next visit. If your next tooth is extra clean then you might get something extra special for it!